When bird watcher Lowell Burket first discovered what he believed to be a never-before-seen hybrid, he was afraid nobody would take him seriously. He spent several days crafting an email about his observations, which he sent to experts at the Cornell Lab of Ornithology. "I didn't want them to think I was just a regular crackpot who was reporting various things to them," the Pittsburgh lawyer told As It Happens host Carol Off. Not only did they take him seriously, but the scientists have now confirmed his suspicions — Burket spotted and photographed the first known three-way hybrid warbler. The findings have been published in the journal Biology Letters. Burket first saw the creature in May in the forests surrounding his family-owned property in Roaring Spring, Penn., where he's spent the last four or five years bird watching on the weekends. He assumed at the time it was a Brewster's warbler — a common hybrid of the golden-winged warbler and the blue-winged warbler. "I thought: 'Cool, I've never seen a Brewster's warbler in the spring,'" he said. But when he was editing his photos later that day, he noticed something odd — the bird had brownish spots on its chest. Brewster's warblers don't have spots. "At first I thought: 'Oh does that have blood on it or something? Or is it dirt?'" Burket said. "And the closer I looked, I could see that they were symmetrical and I thought this is unusual." About three week later, he was out in the woods again when he heard the unmistakable song of a chestnut-sided warbler. He looked around for the song's origin and saw it was coming from the same bird he'd previously photographed. That's when he realized he might be looking a rare three-way hybird — a mix between a Brewster and a chestnut-sided warbler, which has spots. Cornell ornithologist David Toews came to visit Burket and the two of them trapped the bird, took a sample of blood, tagged it and set it free. 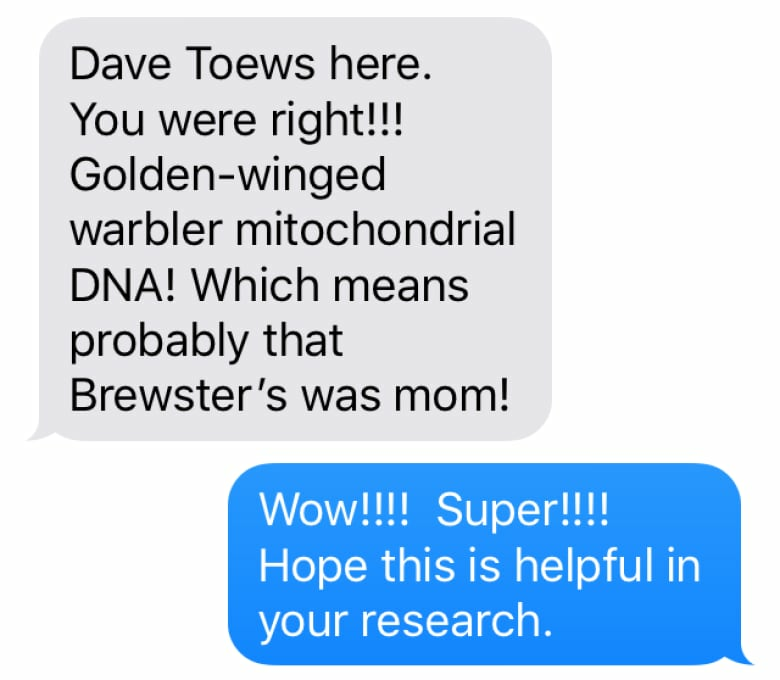 "We looked at the genes that code for different warbler colours," Toews said in a press release. "This way we could recreate what the hybrid's mother would have looked like — the avian equivalent of a detective's facial composite, but generated from genes. We confirmed that the mother would have looked like a Brewster's warbler and the father was a chestnut-sided warbler." So why the cross-species mating? It could be a mistake, or it could point to something more dire. Brewster's warblers only exist because golden-winged warblers are on the decline and must mate outside their genus in order to survive. Their own population dropped by 66 per cent since the 1960s and by 98 per cent in the Appalachian region, according to Cornell University. "That this hybridization occurred within a population of golden-winged warblers in significant decline suggests that females may be making the best of a bad situation," Toews said. The researchers plan to keep an eye on the rare bird and eventually see how it mates. The newly discovered bird has been dubbed Burket warbler, after the proud bird watcher who found it. "That's just crazy," Burket said of the name. "I'm a newbie at this bird watching stuff. So other birders, if they hear this, pay attention to detail, be patient because this could happen to you too." Written by Sheena Goodyear. Produced by Sarah Jackson.